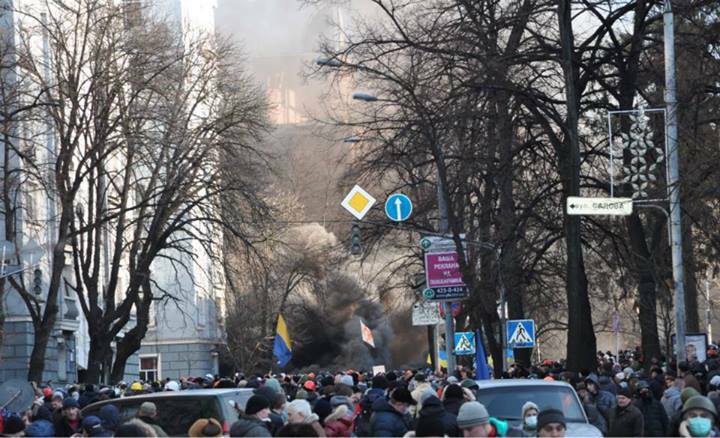 Andriy Bondarenko was on Maidan during the clashes with Berkut, titushki, and police on 18 February. Following is his account of the events, including Berkut’s use of weapons against peaceful protesters. “I would like to post this information on Facebook to preserve it for future criminal proceedings against the regime. I am ready to repeat this account under oath in any court of law, including an international criminal court, and I state this information to be accurate under the penalty of perjury. “I was present during the events on the corner of Instytutska and Shovkovychna Streets. There, the regime used the following means to disband and suppress unarmed protesters: they threw grenades loaded with small pieces of granite and small metallic objects into the crowd; they shot people, targeting their heads with non-lethal rubber bullets; they used buckshot. “The shooting continued after the final push against the march, completely senseless from a tactical standpoint, when people on Instytutska Street started to leave their positions and move down the street en masse. I am not sure if the use of water cannons and bricks hurled into the crowd by Berkut and/or titushki was within the bounds of law; I am just giving this account for the record. “The following is my impression of the events. A group of civilians was standing on Instytutska Street near the wall on the right. I was next to them, and, at the time, I did not have a helmet or a balaclava; my face was exposed and I was dressed in my office clothing. In all, it was obvious that neither I nor the people around me had any means to physically harm the riot police. The protester fighters with makeshift fighting gear were specifically instructed by the journalists to hang out away from us, lest they provoke Berkut into firing on us. “Then, this businesswoman next to me suddenly doubled over, clutching her face with her hands. She was shot in the face or the eye. We called for doctors, who reacted very quickly and effectively. The doctors took her away. Berkut continued to throw grenades, loaded with stones and metal shrapnel attached with tape. When such ammunition explodes, the hot stones go flying, cutting through synthetic clothing like a hot knife through butter, setting clothes on fire. Only down coats or thick cotton stuff can stop those. I also saw a few flashbang grenades go off and send attached metal shrapnel and bolts flying. “I never saw this many wounded people in one place before: it looked very surreal, like in a computer game. Everywhere people fell and doubled over; others took them to the wall or directly to the medical station. Among people who directly fought with Berkut, only two or three were taken out with serious wounds; most casualties were undoubtedly civilians with no helmets, no masks, hands empty. A lot of wounds were to the head, and it is clear that somebody specifically targeted these civilians. The goal of this ‘operation’ was not to neutralize ‘militants’: with a platoon of snipers at their disposal they could do it quickly and effectively. No, their goal was to maximize the number of civilians wounded and killed, more blood, in order to demoralize the protesters. The last stroke was shooting those who were running away in the back. To the protesters’ credit, we did not abandon the wounded or those who fell; we helped them up and carried them with us. “These are the facts. It is not my take on the situation or my interpretation. I saw this with my own eyes and I hope to live through this so I can give my testimony to the investigators. I am not a lawyer, but you do not have to be one to understand that I and several thousand other people witnessed a planned terror attack by the police special forces and regime-hired titushki against the citizens of Ukraine. “Now I would like to offer some of my own thoughts on the matter. Yesterday it became clear to me that the regime acted according to a premeditated plan, and this plan was being implemented from the moment Euromaidan started. They knew that there would be a time when they would need to use firearms, and they were ready for us. Our strength in numbers and the motivation of the volunteers and activists were no match for a well-prepared plan of troop rotations, premeditated use of firearms, and the coordinated distribution of radio-equipped snitches on city rooftops. They did not allow for any improvisation; there was a prepared plan and it was implemented. In a classic move, they allowed groups of protesters to spread out and then neutralized them one by one. If they wanted to prevent us from entering the government quarter, they could easily have done so by blocking Maidan earlier in the morning. So we had the ‘peaceful march.’ We were doomed from the beginning. Somebody on our side failed to consider, to believe, that the government would go so far. “A few words about motivation and demoralization. I do not know if it was a mistake of the regime or a part of their plan, but for many thousands of people, including myself, last night changed a lot. Something new emerged that was not there after the first casualties on Hrushevskiy Street on 20 January. There is no more fear or angry excitement, but only calm readiness to face the inevitable. “Very likely, they will disperse Maidan by force, killing another 100, 300, 500 people. Yet this will achieve nothing, and will only make their fate worse. Recent events in Lviv–people’s occupation of governmental buildings and military bases–are only the harbingers of things to come. It is not known when exactly this will happen in Kyiv–tonight, in a week, or in a month–but it is inevitable. And the regime will face the consequences when the contents of its military arsenals fall into the people’s hands. “I am not sure if this is part of their plan or the latest stunt of the Kremlin’s political technologists, who are too stupid to finally realize that there is a fundamental difference between Ukrainians and Russians. Now it is irrelevant. One thing is clear: every one of them in the regime, from top government pigs to the last corrupt judge and prosecutor, had better pack their bags and their families and load themselves on a plane or a train headed far beyond the eastern border. Retributions are inevitable and it would be a shame if those of them who were not responsible suffer the consequences.